This question has long perplexed both backyard chicken hobbyists and the lay philosopher. Although we donât have any answers to this philosophical question, we can crack (pun intended) a few attempts at answering five of the most common questions people often have about chicken eggs. Youâll discover that, common as it may be, the ordinary chicken egg is anything but common or ordinary. Five Things About Chicken Eggs: Did You Know? Fact 1: Are chickens a good source of protein? Chicken eggs are one of the best sources of protein. In fact, the United Nations Food and Agriculture Organization reports that its protein quality ranks higher than the protein found in other foods, such as beef, dairy and fish. The chart below illustrates the basic nutritional qualities of the chicken egg. Fact 2: How are chicken eggs rated? Â Fact 3: Are chicken eggs healthy for you? Undeniably, yes! Not only are chickens high in protein, but youâll also find every single nutrient needed to support life with the sole exception of vitamin C. The University of Illinois reports that eggs have up to 7 grams of protein; easy-to-digest fats; a wide range of vitamins, including the B vitamins and vitamin D, all which the university says are ânecessaryâ¦for growth;â and minerals like phosphorous and iron. Fact 4: How often should I collect my chicken eggs? When youâre raising backyard chickens, itâs important to collect your chicken eggs as often as you can. The longer the eggs are left out in your chicken coopâs nest boxes, the greater the chance of breakage, spoilage and them getting dirty. 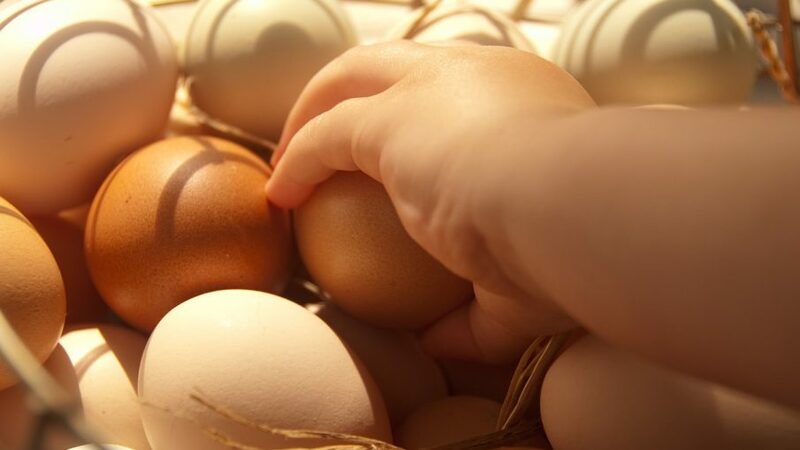 If your eggs get dirty, wash your collected chicken eggs using a soft brush or some fine sandpaper. If your eggs are extremely dirty, use water thatâs warmer than the egg itself. Dry the egg carefully and refrigerate it immediately. Â Fact 5: What else are chicken eggs used for? Besides making a tasty omelet, chicken eggs also get widely used for other purposes. For example, they can be used in skin facials, hair conditioners and hair shampoo. Bonus question: How do you hard boil fresh chicken eggs? Fresh chicken eggs are notoriously hard to boil. Theyâll often get stuck to the shell, making peeling a nightmare. To hard-boil a freshly laid chicken egg, use a needle and poke a tiny hole in the egg shell before you boil it. Alternatively, add a few pinches of salt to the boiling water before submerging the egg. This will make peeling the fresh chicken egg a breeze!